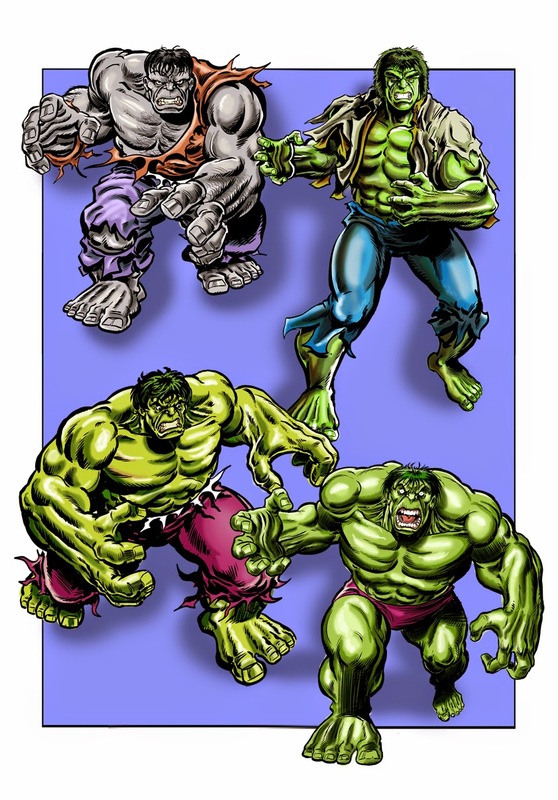 Here are a collection of different era Hulks that I have drawn this past week or so. We have the original Grey Hulk from Incredible Hulk #1 (1962), who was also drawn in the 1980's by such artists as John Byrne, Sal Buscema, Todd McFarlane, Jeff Purves and Dale Keown. Next we have what is probably the most famous Hulk of all... certainly for a generation of viewers from the 1970/80s. The Incredible Hulk, played by big Lou Ferrigno in the classic TV show... drawn in my retro-style comic style. We then have my homage to Sal Buscema's classic corner box image (which debuted around Incredible Hulk #200), and the Mindless, Savage Hulk who debuted in Incredible Hulk #299. The Savage Sword Of SKAAR, Son Of HULK! Custom Death's Heads and TV Hulks!